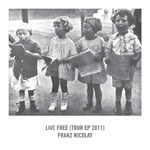 #1-5 by Franz Nicolay. #6 by Warren Zevon. #1 recorded in Brooklyn by Franz Nicolay. #2, 6 recorded in London by Markus Barnard. #3-5 recorded live at Railroad Playhouse, Newburgh NY 7/28/11 by West West Side Music, mixed by John DeLorme. Mastered by Alan Douches at West West Side Music. Cover design by Ariana Nicolay.